It is relatively easy to photograph a swarm insects where some are in focus and others appear as orbs. There are examples elsewhere on this site. Such photos demonstrate how orbs are formed, depending on the precise distance of the 'orbing object' from the camera lens. With a longish exposure (1/60s or more) insects appear like 'flying rods'. But what about dust? Some people may doubt that it is possible to photograph dust with ordinary consumer cameras. Certainly, casual attempts to photograph dust are extremely unlikely to be successful. 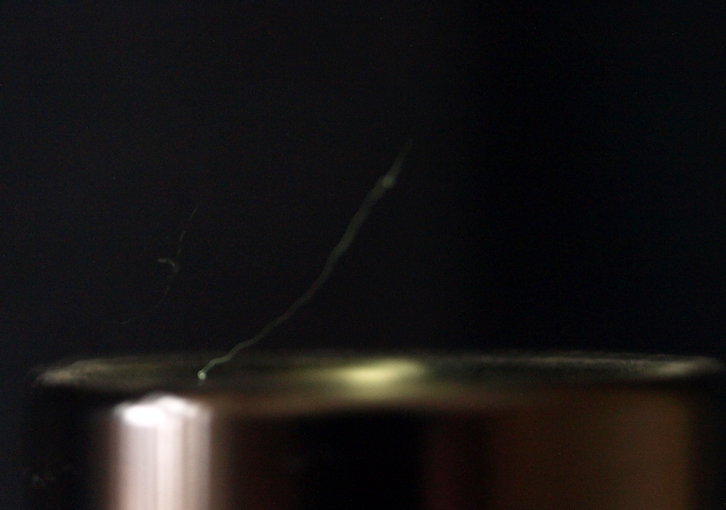 That is because dust particles are very small (typically 0.001 to 0.1 mm) and not particularly reflective. Only dust particles very close to the camera lens (within a few cm) will be large enough to show up. Even then they will usually to be too out of focus and/or not bright enough to show up. There is, however, one important exception to these circumstances - when taking flash photos using a high depth of field. These are, of course, the circumstances in which orbs are typically recorded. An orb zone is formed in this situation such that the particles of dust show up as bright circles of light in the foreground of pictures (orbs). Many people have tried blowing dust in front of cameras, taken flash photos and duly got orbs. A small number of people might still claim that getting orbs when you blow dust in front of a camera could still be a coincidence, despite the fact that it is easily reproducible. However, in the interests of setting such people's mind at rest, it can be demonstrated that it is possible to photograph dust in focus with an ordinary consumer camera. And so, here is such a photo. The photo shows a powerful torch, the shiny object at the bottom (it is pointing upwards). Just above it, you can see two light streaks caused by dust. The one 'attached' to the torch is easily the more impressive. It was seen through the viewfinder of the camera just before the exposure. It floated down towards the torch, causing the light streak, finally appearing as a tiny orb at the bottom of its journey. The exposure time was 2s, which is why the dust appears as a streak. It only appears at all because it is being illuminated by the torch from below, in much the same way that you can see dust on sun beams in an otherwise darkened room. The dust is only just in focus. If it had been out of focus, it would have appeared as a series of interconnected orbs, rather larger than the streak shown. So a normal digital consumer camera can take photos of dust, though it certainly isn't easy. It is much easier with flash because the light is a lot brighter than even this powerful torch. No flash was used in this experiment. To get this photo I used a tripod to ensure the camera was steady. I used a dark background to help show up the dust. I ensured that none of the torch light pointed towards the camera, otherwise it would overwhelm the image. I waited for dust to drift into view so it was entirely natural.